Nature’s Sunshine Dulse Liquid provides essential support for the thyroid gland. Dulse, scientifically known as Rhodymenia palmata, a red seaweed found in the North Atlantic and Northwest Pacific, contains iodine, an important trace mineral. Iodine supports proper production of hormones secreted by the thyroid. 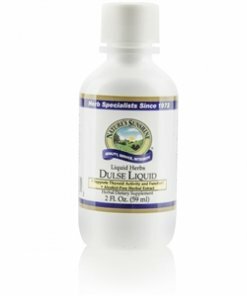 Dulse Liquid is alcohol-free, glycerin based, and palatable. Instructions: Take 1 ml, approximately 15-20 drops (1/4 teaspoon) in water once daily.